Credit Karma has released a new commercial with the #heres2progress hashtag, encouraging people to start their journey of financial progress by visiting CreditKarma.com. “On a Saturday in July, Tom and Tina will watch their son take his first steps on the living room floor of their dream home. But first, a few things must happen,” the voiceover says at the beginning of the 60-second spot, which then takes viewers on a journey back in time, allowing them to see the things Tom and Tina must go through before seeing their dream come true. “To start, living in a neighborhood filled with college students must begin to take its toll. Tom must start an argument about Tina’s debt, prompting their first real fight about money. This will cause Tina to do five minutes of yelling, three minutes of crying and seven minutes of research. Tom must improve his credit, while Tina must negotiate 17% of pay raise. They’ll bag lunch, shop generic (Cheap Dish Soap), limit their dumb purchases, and use Credit Karma to see how much house they can afford. Eight minutes into the tour, Tom and Tina will decide on their home. 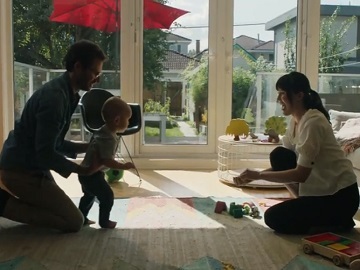 Twelve hours later, they’ll be approved for their mortgage,” the voiceover adds, also revealing the time and place the two lovers conceive their baby. “And several months later, with the help of Credit Karma, well…. here’s to progress,” the voiceover says at the end of the commercial. Earlier this month, on October 2, the personal finance technology company announced its expansion within insurance with the launch of a new tool that brings transparency to its members by enabling them to see what they could be paying for auto insurance based on what members like them are paying for the same coverage. According to Credit Karma, which estimates that Americans overspend on auto insurance by nearly $21 billion per year, this move “will address the mispricing issue of Americans’ auto insurance policies” and give consumers “the information they need to make the best decision on their insurance policy, without the headache”. Credit Karma has been offering a monthly credit score through its free online credit report and credit monitoring service since 2007, when it was founded. The score provided by Credit Karma is VantageScore 3.0, which was developed by the three credit bureaus – Equifax, Experian, and TransUnion – as an alternative to the FICO scoring model. The company also helps consumers track, maintain and improve credit health with free tools and information, provides recommendations for credit card and a variety of loans, and free federal and state income tax preparation, a recent feature introduced for the Tax Year 2016 filing period in 2017.